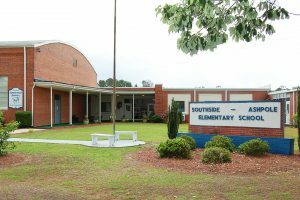 Achievement for all Children (AAC) is the Innovative School Operator (ISO) for Southside Ashpole Elementary School in Rowland, NC. They are a North Carolina-based not-for-profit organization committed to working with the Innovative School District (ISD) to implement a comprehensive system of support to serve the needs of all students at Southside Ashpole, improve academic outcomes and engage in a partnership with the local community. TeamCFA is AAC’s curriculum partner; they offer rigorous and data-driven curriculum geared toward accelerating academic growth and improving student achievement. AAC’s organizational mission is to support the public schools in North Carolina in achieving better outcomes for all students by focusing on the challenges that exist at the lowest performing schools in the state and addressing the cumulative curricula, facilitate strong community relationships and work in union with the team of talented and dedicated educators in the schools. Innovative School Operator applicants go through a very rigorous selection process. Applicants are required to complete a comprehensive application; participate in a thorough review by a third-party evaluation firm; present their plan to a community panel; respond to requests for supplemental information; engage in face-to-face negotiations; and undergo extensive background checks. Through that process, AAC was recommended to the State Board of Education by Innovative School District (ISD) Superintendent, Dr, Eric Hall, and ultimately approved by the board as the operator for Southside Ashpole Elementary. Through the delivery of a classical curriculum—Core Knowledge Sequence for reading, science and social studies instruction and Singapore Math for math instruction—AAC will nurture well-rounded, highly educated, successful students. A character education program, Core Virtues, will help to further facilitate student academic performance and cultivate character through the promotion of basic moral, civic and intellectual virtues, including responsibility, diligence, honesty and humility. By emphasizing high academic expectations, strong character development and individual responsibility, Southside-Ashpole will improve academic outcomes and inspire students to become lifelong problem solvers, effective communicators, and contributing members of their community. AAC also actively engages families and community members to support and be involved in the school, inviting them to participate in meetings, events and help to identify the strengths, resources, needs and desires of the community. This level of participation is crucial in improving individual student achievement and school success. The ISD, in partnership with AAC, welcome community members in Robeson County to play a role in the positive change we are committed to bringing to Southside Ashpole and the town of Rowland.